yes, it’s been forever since my last blogpost. MUCH has happened this spring and i will do my best to synopsize. first of all, and most exciting: domenica is returning this week from her escapades in europe. during and after her semester abroad in pau/pyrenees, she traveled to: barcelona, bayonne, bordeaux, biarritz, toulouse, lourdes, paris (3 times! ), budapest, vienna, san sebastian and dublin. we cannot wait to hear of her many adventures, newfound friends and enjoy her smile and warm demeanor. once sated from our flavorful picnic, we enjoyed a coffee and canele at BAILLARDRAN, the famous shop. we strolled the cobbled streets and found a large bookstore, LIBRAIRIE MOLLAT and spent some time browsing. little did i know, dave and domenica secretly purchased 3 small cookbooks (in french) to add to my collection. that afternoon we enjoyed an organized wine tasting with erik at WINE CELLAR & CO. erik was very personable and knowledgeable and his shop is well-stocked with wines of the bordeaux region. after a respite and a walk along LA GARONNE (river) we had an authentic and delicious meal at a local “bordelaise’ bistro. we started with a champagne toast to the birthday girl (me), to domenica for studying abroad in such a unique and lovely place, and to dave, for working so hard to make it all happen and taking the time off work to be with his “girls”. may 4th (my 60th) seems ages ago and we’re back to our respective routines at work and home. however, there is much to be happy about in cardiff as well. 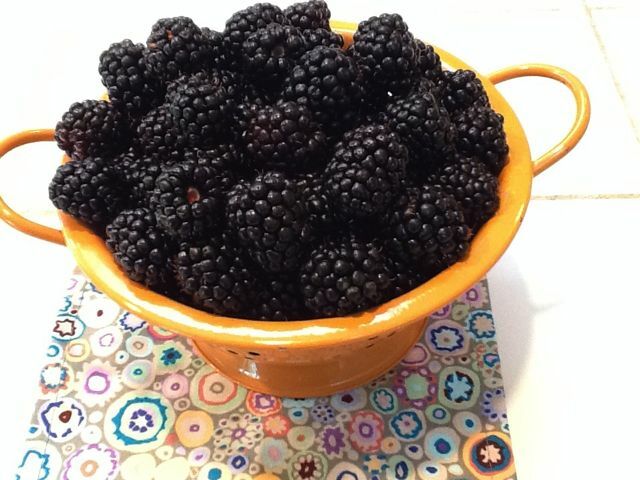 we are blessed with daily baskets of ripe, juicy, antioxidant laden blackberries. please see my FACEBOOK page for a representative photo of a blackberry, nectarine, walnut “crisp” that dave and i made last week. the rest of the garden is doing well, too, with dahlias, cherry tomatoes and melons coming shortly. soon domenica will arrive home for summer (or part thereof) and you can be sure we’ll be “playing in the kitchen”, posting recipes and photos and testing them first on dave, our resident (and happy) taste tester. p.s. a spécial merci beaucoup to adam louis troldahl (domenica’s cousin) who was the consummate host during her stay in vienna.